I got this recipe passed down from a lady way down in Cocodrie, LA who used to make it for a restaurant there. It's super simple and the kind of thing where you just basically dump it all together. For a smaller family, consider cutting the recipe in half, because it makes a TON (like 8-10 cups)! This would be good for a football watching party or something where you have a LOT of people dipping into the pot! The soup is super easy to make, and requires almost no "kitchen skills." 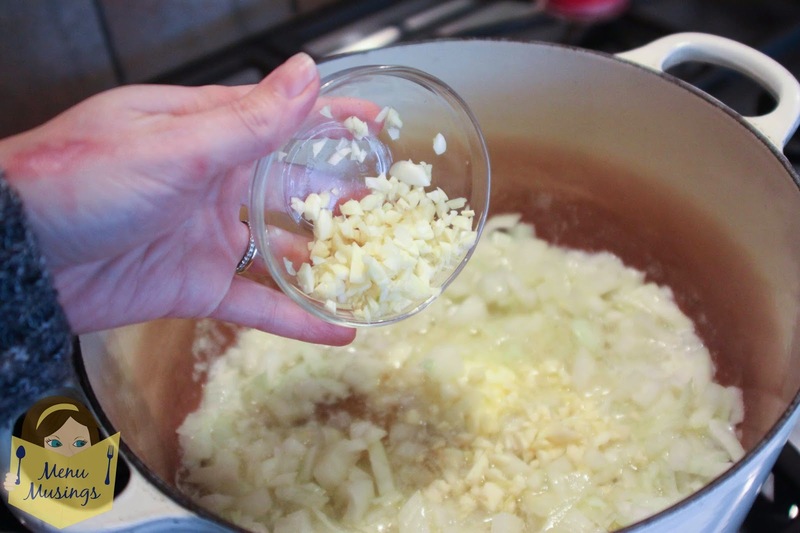 Saute 1 stick butter with 1 chopped onion and 5 cloves finely chopped garlic. Allow them to cook down a few minutes until they all get soft and the onions get a little translucent. 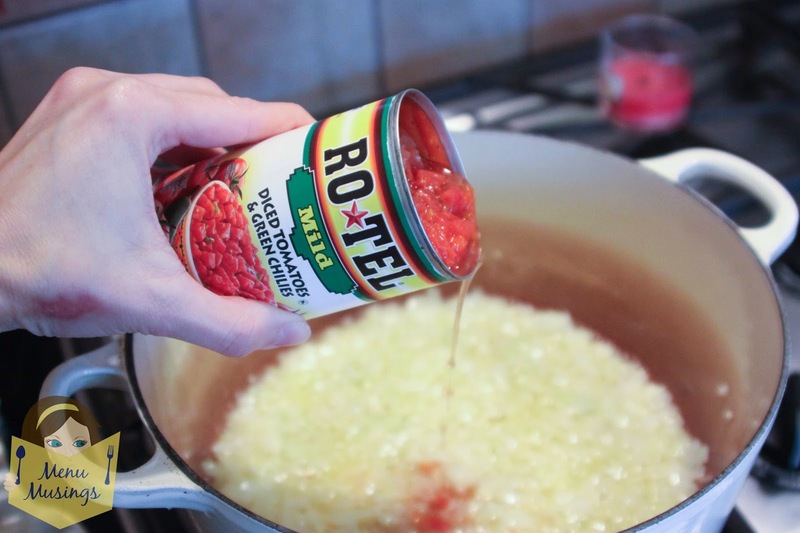 Add 1 can diced ro-tel tomatoes. Vary the heat with the type of ro-tel you buy... from mild to spicy. 2 pounds of shrimp. These are the 60-70 size. Raw, peeled, and deveined. We will cook these on medium heat. 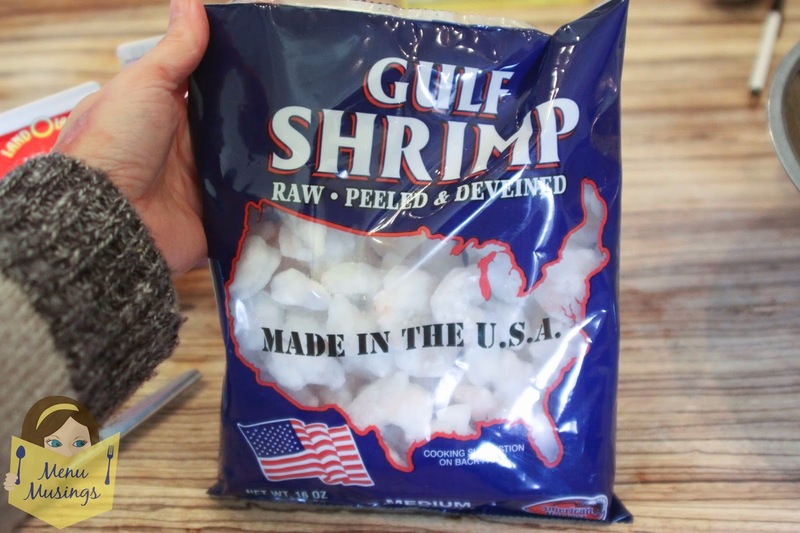 Bring to a boil and cook until the shrimp are cooked, about 8 - 10 minutes. Now lets add a can of whole kernel corn. This will give the soup extra “corn” texture. Next, add a pint each of Half and Half and Heavy Whipping Cream. Heat on low until it's hot. Now we add 1 pound of Velveeta cheese. I know... try not to have a heart attack just looking at it. It IS very rich, but I did use the 2% milk lower fat cheese if that makes you feel better. Stir and heat until cheese is melted. You don't want to keep boiling it after the cheese is in there, or it will scorch on the bottom. Wow, this pot is getting full! 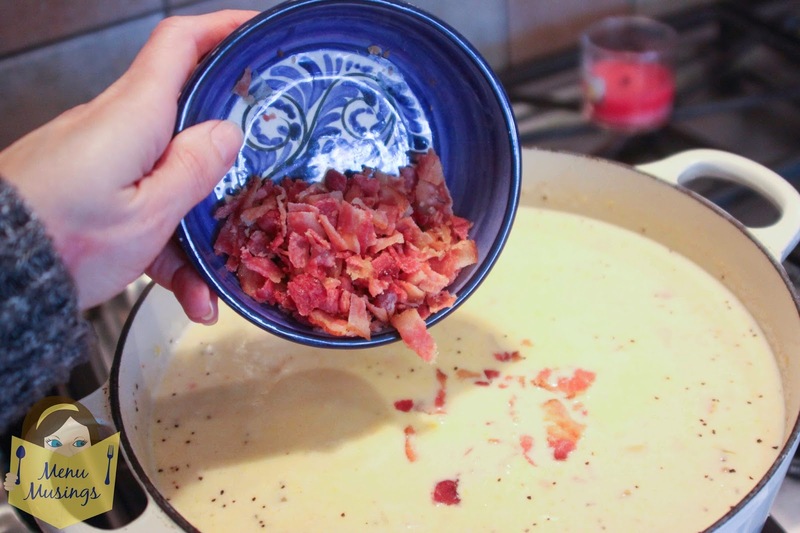 To give the soup an additional textural component, and some smokiness, let's add in the chopped bacon. I cooked these earlier in the microwave and gave them a rough chop. I used applewood bacon. I probably used about 1/3 of a pound. Now that we have all of the "real" ingredients, let's finish up with the seasonings. Add garlic salt and pepper to taste. 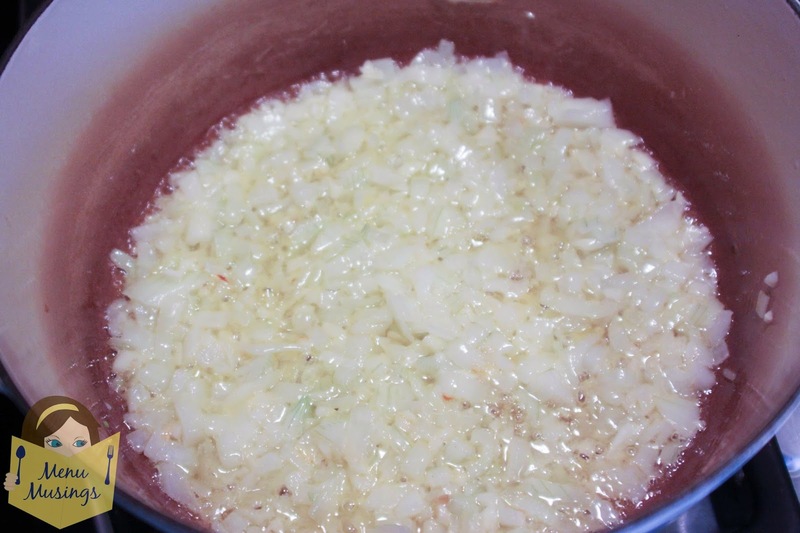 If soup is too watery at this point, bring up to a boil for a few minutes to thicken. As the soup simmers and sits there, it will thicken on its own. I didn't season it earlier, because the cheese and bacon can be very salty. Garnish with your choice of chopped green onions are fresh parsley, some whole cork kernels, and a little extra chopped bacon. This soup would also be lovely served in a toasted bread bowl! 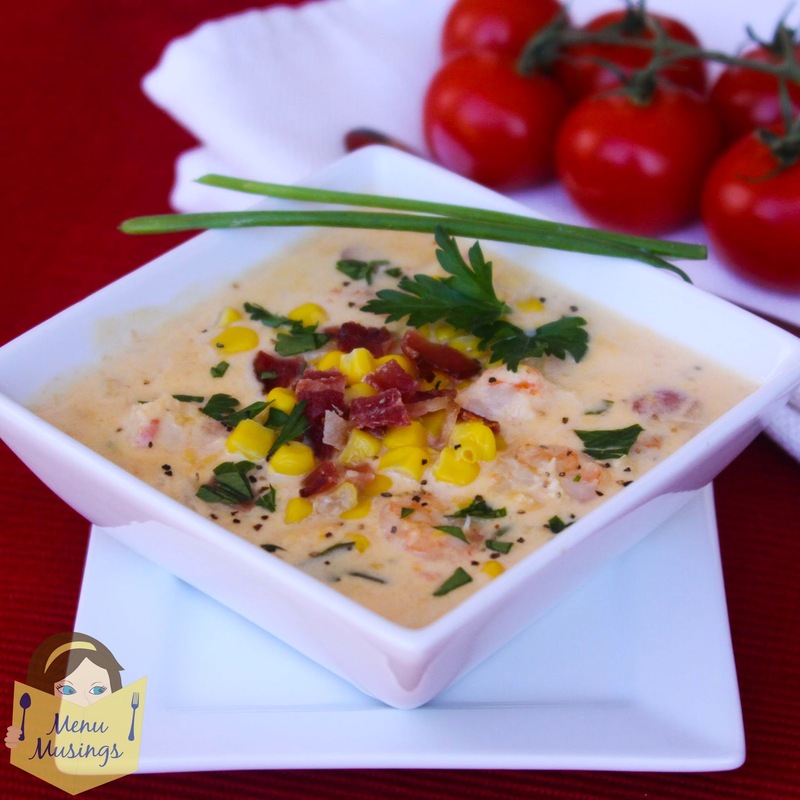 * This soup freezes great!! 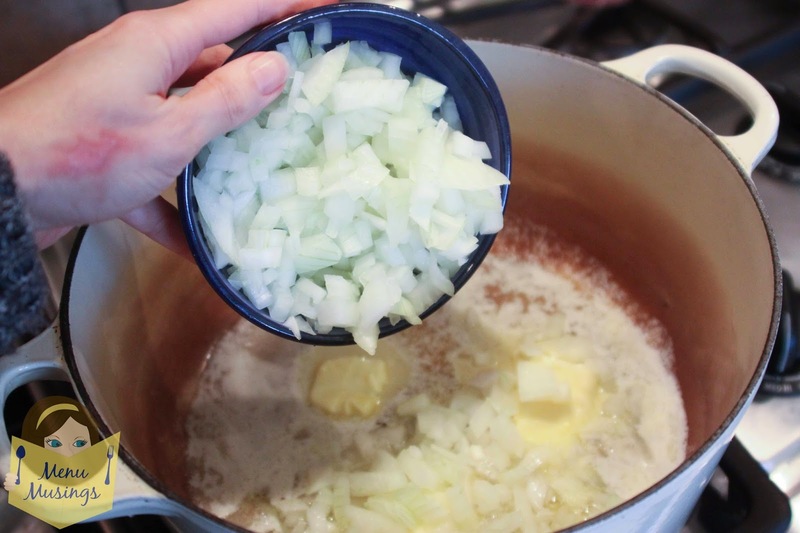 Saute 1 stick butter with 1 onion chopped and 5 cloves garlic, finely chopped. 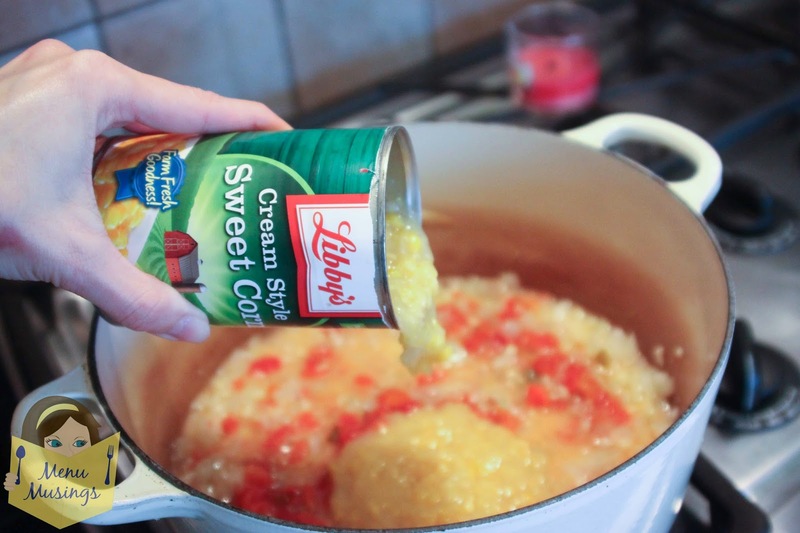 Add: 2 cans cream style corn, 1 can diced ro-tel tomatoes. Vary the heat with the type of ro-tel you buy... from mild to spicy, 2 pounds shrimp (60-70 size). 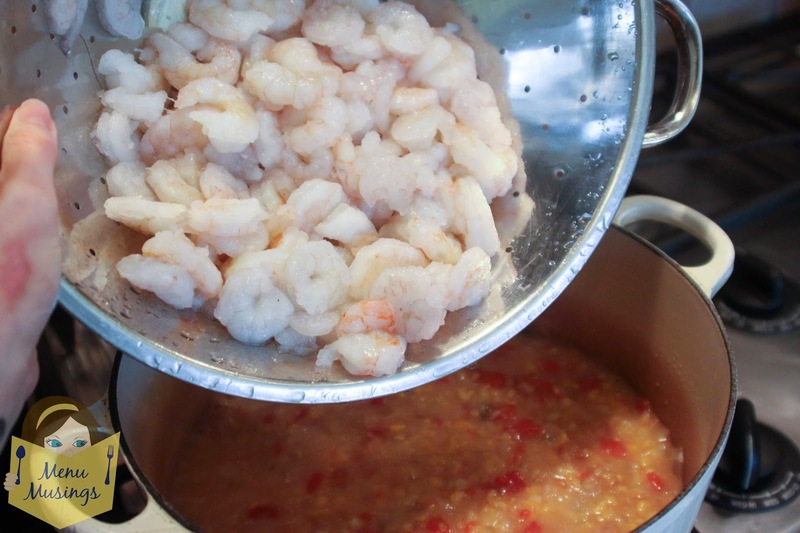 Place on medium heat and bring to boil until shrimp are cooked (8-10 min). 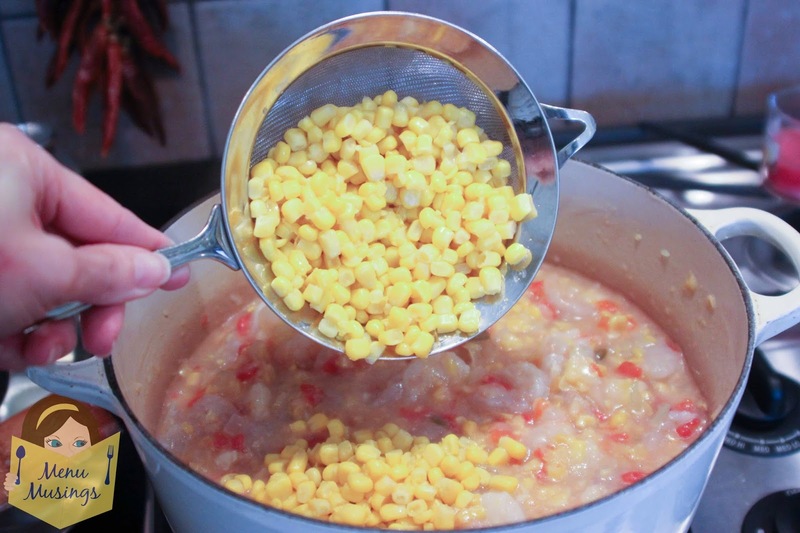 *(optional) You can add a can of whole kernel corn to soup for extra “corn” texture. Add 1 pt half and half + 1 pt whipping cream and heat on low until hot. Add 1 lb Velveeta cheese. 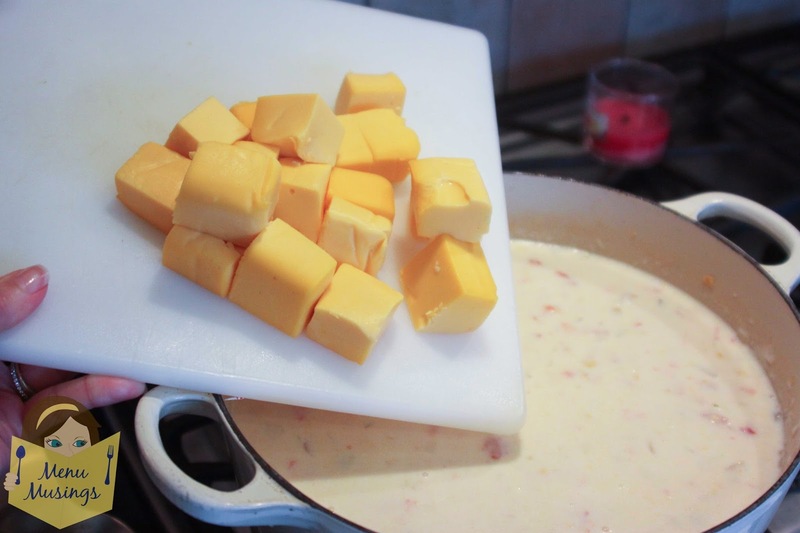 Stir and heat until cheese is melted. You don't want to keep boiling it after the cheese is in there, or it will scorch on the bottom. Optional - add in chopped bacon pieces. I probably used about 1/3 of a pound for the whole pot. Add garlic salt and pepper to taste. If soup is too watery at this point, bring up to a boil for a few minutes to thicken. I didn't season it earlier, because the cheese and bacon can be very salty. 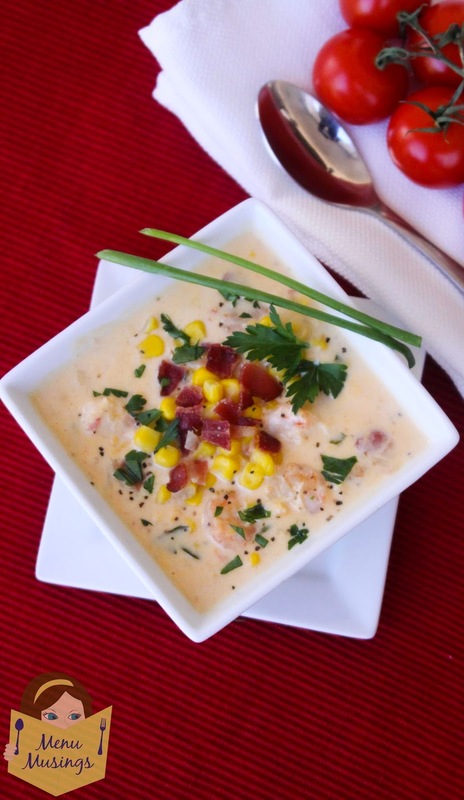 Garnish with chopped green onions or parsley, some whole corn kernels and a little extra chopped bacon. This recipe looks really delicious! To bad that they don't sell those cream style corn cans here (The Nederlands). Well you could just make your own if it's not available to you. Just cut corn kernels from the cob, then scrape with a sharp knife to get all of the milk and pulp. 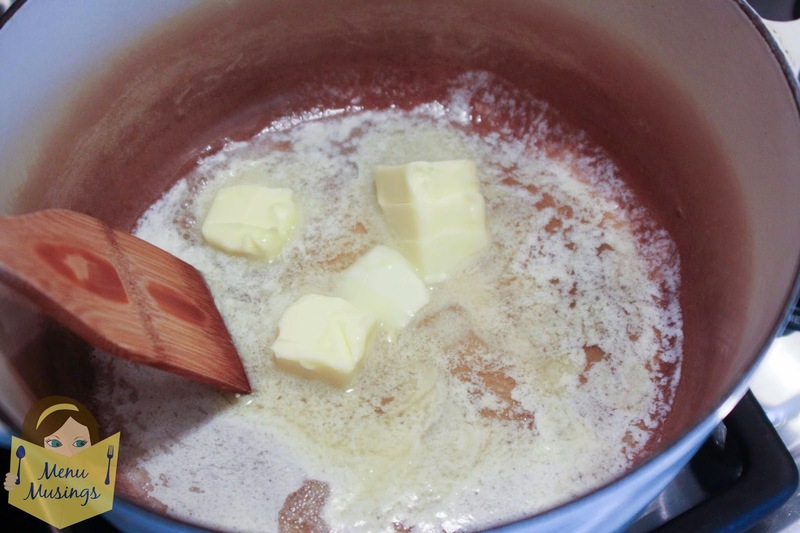 Melt a little butter (maybe 2 Tbsp) in a large skillet. 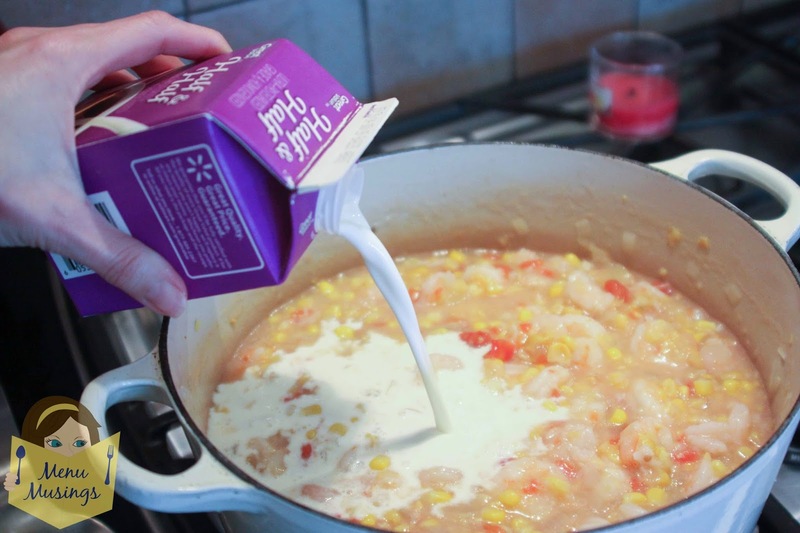 Stir in corn and juices, the 3 tablespoons water, and 1 tsp sugar. Cook until corn is tender. Stir in a tablespoon of flour-water mixture. 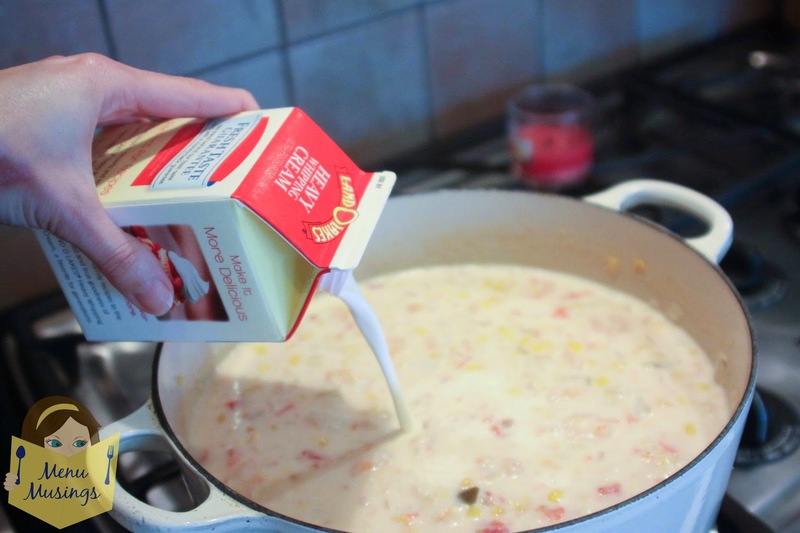 Gradually add a little milk, stirring constantly. Cook for about 2 minutes longer. Do not let boil.